I am an artist who makes work across the fields of visual art, writing, and collaboratively through (guerrilla) street theatre. I make mischief that is playful, politically defiant and delivered with wit and humour. The participatory performances instigate public dialogues that are disruptive and imaginatively delinquent. I seek to blur the boundaries between art, performance and everyday life. My doctorial practice-based research developed the work of Chantal Mouffe and her conception of agonism in relation to art practice. 2018 - PhD Politicised Street Theatre, Loughborough University. 2013 - MA Art and the Public Sphere (Distinction) Loughborough University. 2008 - PRINCE2 - Foundation, Raj Khanna Associates, Derby. 2000 - Artists in Educational Settings, Post Graduate Certificate, University of Derby, Derby. 1998 - BA Fine Art, University of Derby, Derby. 2015 - Enterprise Projects Group/HEIF Enterprise & Research funding, Loughborough University, Loughborough. 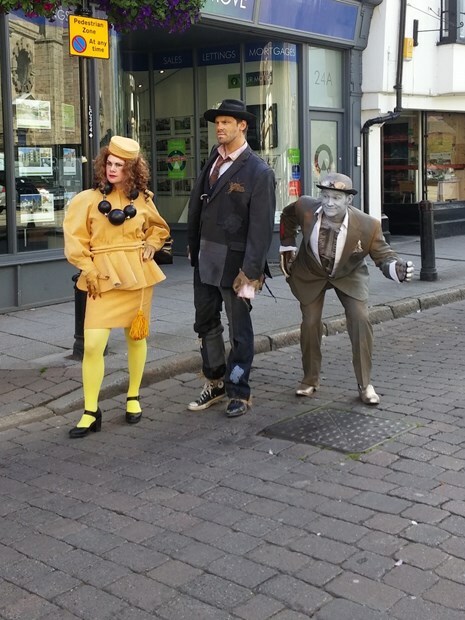 2015 - Street theatre commission, Derby Feste 2015. 2013 - Creative Student Award, Loughborough University, Loughborough. 2013 - PhD Studentship (3-years), School of the Arts, Loughborough University, Loughborough. 2013 - Arts Grant, Bath & North East Somerset County Council, Bath. 2013 - Bedlam Fair: performance & peer review bursary, Bath Fringe Festival; Arts Council England, Bath. 2012 - Graduate School Prize, Loughborough University, Loughborough. 2011 - MA Scholarship (Art and the Public Sphere), School of the Arts, Loughborough University. 2011 - Mintfest Bursary (emda), Mintfest Summer School for Street Arts, Kendal. 2015 - Testing Agonism with Mischief: Mark Thomas and 100 Acts of Minor Dissent. Politics and Humour: Theory and Practice, The University of Kent. 2014 - Guerrilla performances of political satire in the public sphere. The Critical Role of Art in the Public Sphere, 6th Annual Research Student Conference in Arts and Design, University of Wolverhampton, UK. 2013 - Bankers on Active Community Service (BACS). Axisweb Selected Film Screening Programme, The Art Party Conference, Scarborough, UK. 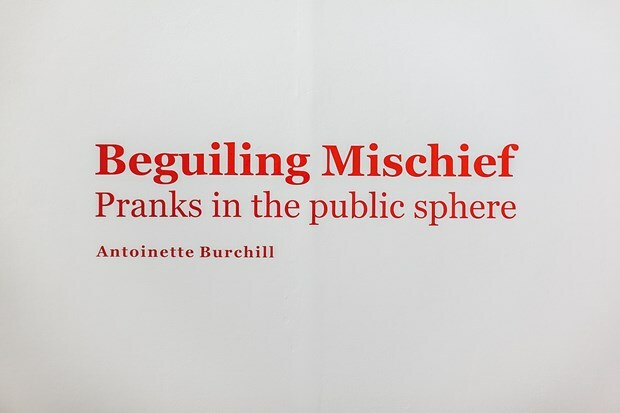 2013 - Mischief and the counter-public sphere. Generations of Protest: Marxism Matters? MeCCSA Social Movements Network, De Montfort University, Leicester, UK. 2013 - Technology, the participant, the passer-by, being convivial and its relationship to forming opinion. Eighth International Conference on the Arts in Society, Eötvös Loránd University, Budapest, Hungary. (Co-written with Mel Jordan). 2013 - Beguiling Discomfort. Performative Mischief Symposium, Loughborough University. 2013 - Shared Awkwardness. Public Communications: Art, Technology & the Public Sphere research group workshop, Loughborough University. 2013 - Shrinkles of Dissent, UrbanSelkie, UK. 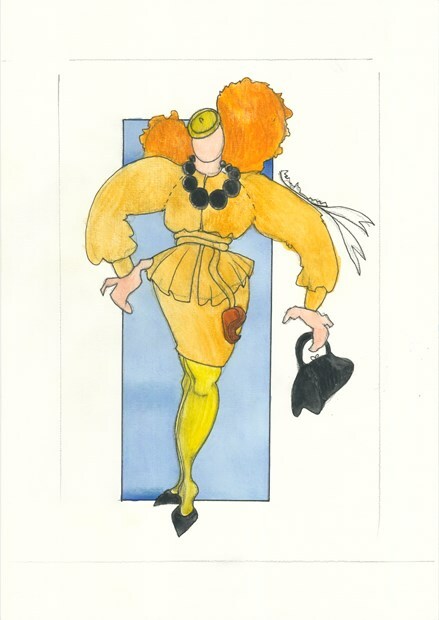 2009 - Ms. Mischief presents: Ms. Mischief's quest for the Golden Fleece, UK. 2018 - Re-Imagining Citizenship, LU Arts Gallery, Loughborough University. 2013 - The MA Show 2013, Loughborough University. 2012 - Games People Play, The Atrium Gallery, The ICCA, Nottingham. 2012 - Midlands Open, Tarpey Gallery, Leicestershire. 2011 - Card Deal, Artcore, Deda, Derby. 2011 - Card Deal, Artcore, Departures Gallery, East Midlands Airport. 2011 - Games People Play, Artcore, Deda, Derby. 2010 - Bon Voyage, Artlink, Hull. 2010 - Grammar & Heather, The Beetroot Tree, Draycott, Derbyshire. 2010 - Mail Art, Tron Theatre Gallery, Glasgow. 2010 - Showcase, Salford Zine Library, Manchester. 2009 - Don't Stop Believing / Customs and X Files, Derby Quad, Derby. 2009 - MobFormat, Format International Photography Festival, Derby. 2009 - Open Books, Derby Museum and Art Gallery, Derby. 2009 - The 2nd Sheffield Artists' Book Prize Exhibition, Bank Street Arts, Sheffield. 2007 - Dreamscapes, Ridgeway Gallery, Bakewell, Derbyshire. 2006 - Dreamscape Paintings, Melbourne Arts Festival, Derbyshire. 2006 - Mob Format, Format International Photography Festival, Derby. 2005 - Leicester Open, Leicester City Gallery, Leicester. 2004 - Dreamscapes, Open Exhibition, Derby Museum & Art Gallery, Derby. 2004 - Virtual Collect 7 - Painters, St. Marys Gallery, Nottingham. 2003 - Pools of Colour paintings, Wirksworth Festival, Wirksworth, Derbyshire. 2000 - The Wirksworth Festival, Wirksworth, Derbyshire. 1998 - The Dough Key, Derby City Live Festival, Derby. 2012 - Light Relief: the autumn/winter 2012 season, Royal Derby Hospital. 2012 - The Village Green Stage, Pedal Powered Party. Cultural Olympiad, Derby. 2011 - Derby: City of Invention, Derby city centre. Empty Shops & bill boards, Derby. 2010 - COGmachine, Bar One, Derby. 2015 – Freckled Mischief, Derby Feste, Derby, UK. 2013 - The Delegates, Mintfest, Kendal, Cumbria, UK. 2013 - The Delegates, Devizes International Street Arts Festival, UK. 2013 - The Delegates, London (Dalson, City of London), UK. 2013 - The Delegates, Bedlam Fair, Bath Fringe Festival, Bath, UK. 2013 - The Delegates, Bob-a-Job Bankers, street theatre, Bath. 2013 - The Fool King, Loughborough University, Public Communications: Art, Politics & the Public Sphere (EPSRC funded). 2012 - The Delegates, Derby Feste, Derby. 2012 - The Delegates, Street theatre, Widcombe Rising, Bath. 2012 - The Delegates, Masquepony Festival, Lakes Alive, Cartmel, Cumbria. 2012 - The Delegates, The Banquet Tour, Lakes Alive, Cumbria. 2011 - The Delegates, Street theatre, Mintfest, Kendal. 2011 - The Delegates, Street theatre, Derby Feste, Derby. 2010 - Ms Mischief and the Raffle of Shame, COGmachine, Bar One, Newland Street, Derby. 2010 - Synaesthesia Performance, Derby Big Draw, Derby. 2010 - Synaesthesia Performance, Sonic Asylum, The Edge, Birmingham. 2007 - A Drawing in 6 Movements, Derby Jazz, Jazz Week Festival 07, Derby Dance, Derby. 2007 - DJ Stories & Spanners: Mischief Night soundtrack, Hurly Burly, Derby Feste, Derby. 2007 - Ms Mischief presents: The Mischief Night narrative, City-Zen, Derby. 2007 - Ms Mischief presents: The Mischief Night narrative, Hurly Burly, Derby Feste, Derby. 2007 - Synaesthesia performance, Derby Jazz, Jazz Week Festival 07, Derby Dance, Derby. 2007 - Synaesthesia performance, Trigger at Derby QUAD, Derby. 2007 - Visualizing Pinski Zoo - A Derby Jazz gig, Darwin Suite, Assembly Rooms, Derby. 2006 - Synaesthesia performance, City-Zen, Derby. 2006 - Synaesthesia performance, Critical Meet Festival, Derby. 2006 - Synaesthesia performance, Draycott Festival, Derbyshire Intervention. 2009 - Ms. Mischief presents: The SpudOrrery, Feste Wrap Party, Deda, Derby. 2008 - DJ Stories & Spanners presents: HOME Trajectory, soundtrack, HOME launch, Derby. 2008 - Ms Mischief presents: The Carrot Questions, HOME launch at Big Blue, Derby. 2010 - Dreamscapes, Outside the Intensive Care Unit, Derby Royal Hospital. 2007 - Dreamscapes, Deda, Derby. 2006 - Dreamscape Paintings, Gallery S, Matlock, Derbyshire. 2005 - Dreamscape Paintings, Banks' Mill Gallery, Derby.